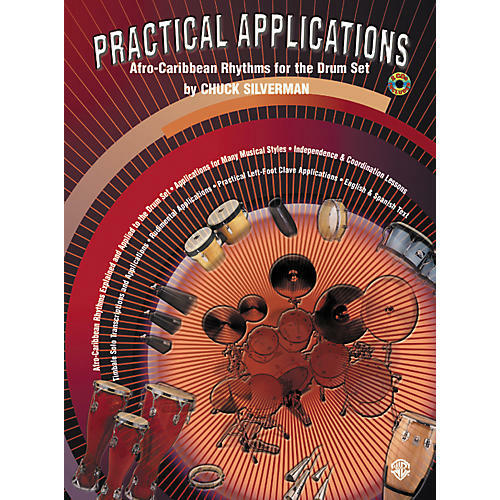 Practical Applications by Chuck Silverman shows drummers Afro-Caribbean rhythms that develop their overall chops on the drum set. Formally a 3-part instructional series that explores Afro-Caribbean rhythms as applied to the drum kit. The unique drum lessons focus on teaching rhythms while developing total drum set technique and independence. Includes English and Spanish text and an authentic recording performed by a band of Latin music all-stars. This revision combines the series into one book and 2 CDs. Drumming styles covered include chachacha, samba, mambo, cumbia, bolero, 6/8 merengue, songo, bossa nova, NY Mozambique. Latin, jazz, rock, and funk applications for these styles.